A few of the Emphasize team are breaking out of Calgary to visit Boston and attend INBOUND 2013 in August. 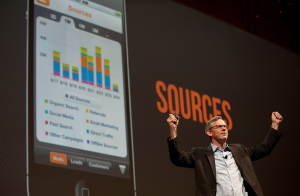 Hosted by HubSpot, INBOUND is the world’s largest inbound marketing conference, and the four days will be packed with sessions incorporating keynote speakers (Arianna Huffington, President & Editor in Chief of the Huffington Post, is one), product demos and maybe even some socializing. To prepare we recently watched a few of the speakers from last year, and were blown away by the relevance of their messages and the quality of their deliveries. Among our faves was Marcus Sheridan, who is President of River Pools and Spas and a HubSpot customer. Known as “The Sales Lion” on Twitter, Sheridan struggled to keep his pool company afloat for several years – spending a lot of money on traditional marketing techniques – until 2008 seemed like it would be the end of the line. The pool building industry was down 50 to 75 per cent and although Sheridan was investing in advertising, it was not generating the necessary amount of sales to keep going. While researching solutions, he came across HubSpot and discovered inbound marketing for the first time. He realized that not only could he control his website better, but he could also use content to his advantage. It only took until 2010 for River Pools to begin to turn a profit again, and his website is an exceptional performer. In 2007, Sheridan’s swimming pool company spent about $250,000 on advertising to achieve a gross sales total of about $4,000,000. In 2011, they spent $18,000 to reach a gross sales total of roughly $5,000,000. Before HubSpot, content to Sheridan was just the stuff that takes up space on the pages of his website. Now, website content is literally the backbone of his business. Sherdian didn’t think pools were worth blogging about in the beginning. They’re not that interesting, he said. He was wrong. Simply through smart blogging Sheridan was able to increase the visits to his website per month from 500 to more than 14,000. Pools can actually be very interesting, and writing about them became his passion. Sheridan’s blog is now the number one educational blog about pools in the world. Sheridan has been big and bold in his content strategies, and the results have been remarkable. He is straight-up, honest and truthful – something that the marketing industry isn’t necessarily that well-known for. Traditional marketing tends to omit information on purpose. For example, you rarely hear a soft drink company talk about how their products can be harmful to teeth. Instead of hiding the most important aspects of his business – such as, how much a pool actually costs – Sheridan reveals the answers clearly and concisely week after week. In fact, one of his best performing blogs is entitled, How Much do Above Ground and Inground Swimming Pools Cost? Small Inground Fiberglass Pool Design Awards for 2010 – Sheridan actually gives his competitors awards in this one! How To Avoid 4 Common Fiberglass Pool Installation Problems: Powerful Video! The impetus for every blog Sheridan writes is simple. He just thinks of something he is often asked, and then goes ahead and responds. It’s that easy in reality, but in practice it can be very hard. It can be difficult to break old habits – especially when comes to revealing information you may not necessarily want your competitors to know. Instead of thinking about them, think about your customers. What would THEY want to know? The best thing about inbound marketing is that it is a collaborative process. It has to be! Get everyone involved watch the ideas begin to fly. Ask your salespeople what questions they hear the most, and then write about them. Get your product developers talking about what they’re most proud of, and then write about it. Give your team digital cameras so they can take pictures while they’re out in the field, and then blog about your adventures. It’s all valuable content that not only makes for a robust website that provides value to your customers, it can also bring you together as a company.